Today is a great day to be an Access All Areas member! Dustin Lee from RetroSupply has kindly donated the popular Atomic Age Print Kit for members to download. It’s a powerful PSD that allows you to create authentic halftone and textured ink overlays with one click! What’s more, this comprehensive pack comes with 2 bonuses; The Atomic Age Refill pack contains additional textures, and a full set of high resolution Atomic Halftone Brushes. To round off the pack, it also includes handy instructions and a video tutorial to show you exactly how to apply the effects to your own work. RetroSupply‘s mission is to bring the awesomeness of handmade goods to digital design. Their range of products make it easy for designers to add the craft and tradition of retro design to their work via textures, brushes and actions. For the next 7 days, all Spoon Graphics readers can receive $7 off their purchases from the RetroSupply Product Catalogue with the code SPOONGFX7, or gain free access to 9 best-selling RetroSupply goods by signing up to their newsletter. Find out more about RetroSupply Co.
Access All Areas members can now download The Atomic Age Print Kit as part of their membership. 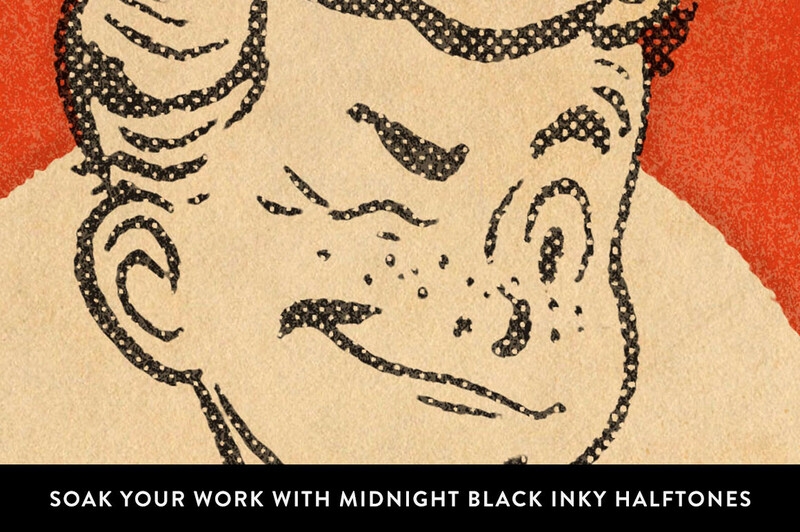 Use it to add inky black halftones and rough edge bleeds to your work, just like news prints from the old presses of the atomic age. Just paste your black design work on one layer (clearly marked in the file) and your color background on another. Save the file and like magic you have the effects you see above. Alternatively, use the bonus halftone textures & brushes to manually apply aged effects to your designs. wow that’s great offer chris! This is fab! Dustin is really growing in leaps and bounds! Thanks to you both! Most definitely! Thank you Su. Wow, this is really great! Thank you Chris and Dustin Lee! Great offer. Thank you guys.